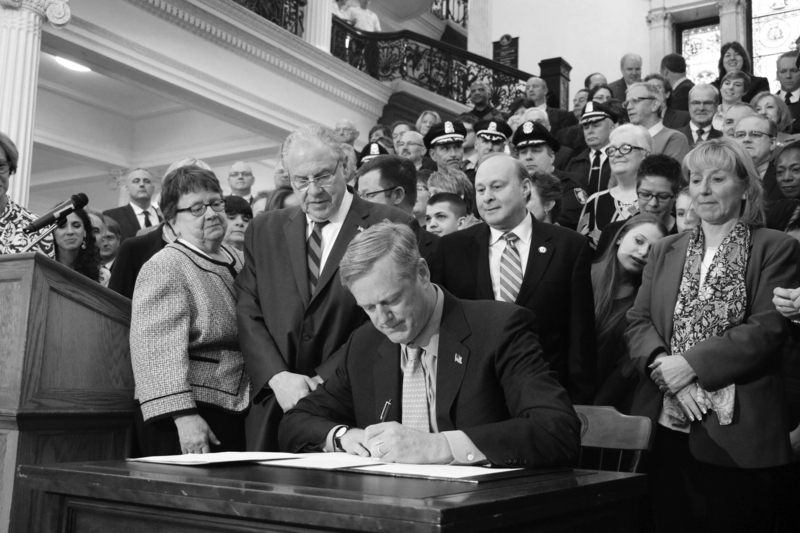 Massachusetts Governor Charlie Baker signs a law about the opioid crisis. More than 115 people die every day in America after overdosing from opioid use. Fentanyl, heroin, prescription painkillers, and similar drugs contribute to what is the leading cause of death for people under the age of 50. Millions have been poured into programs designed to combat this crisis, yet very little progress has been made. The past three decades have been marked by neoliberal attacks on working-class people and the poor. This has meant growing unemployment, stagnant wages, and cuts to crucial social services. The opioid epidemic has been concentrated in areas where the main employer has left in search of cheaper labor, whether that be overseas or in different parts of the country. There is no question that a society riddled with addiction is a society in profound crisis. Nationwide, life expectancy rates have dropped for the second year in a row marking a trend that doesn’t appear to be slowing down. There are not sufficient programs in place to prevent or treat people before and during opioid use. Health care, and crucially mental health care, is not available to everyone as it should be which only exacerbates the conditions necessary for addiction. There is a link between painkiller/opioid use and depression and, for many, using opiates is the only way to temporarily relieve the pain. In order to actually solve the crisis of opioid addiction, we need to address the root causes in society that lead people down a path of addiction. Massachusetts Governor Charlie Baker has merely acknowledged this crisis, pledging to provide “treatment that actually makes sense.” Baker’s $100 million plan features involuntary hospitalization for people deemed a danger to themselves or others. Were this to pass, it would serve as an enormous invasion of citizens rights. Those suspected of being a “danger” could be held up to 72 hours against their will, which could be extended with court approval. The proposal also includes a system of screening school students to determine how likely they are to use drugs. This arbitrary system would do little but continue the culture of alienation in schools and marginalize those added to this list. Baker’s proposal leaves out a crucial player in this epidemic: the pharmaceutical industry. While Baker seeks a five-year minimum charge for anyone involved in the sale of opioids, the biggest sellers and pushers of opioids – big pharma and health insurance companies – aren’t prevented from pushing doctors to freely subscribe their big profit makers.. This is a clear indication of the influence big pharma has on the pockets of our politicians and they are buying their way out of responsibility. Treating opioid users as criminals would do little in the way of helping anybody. 76% of those jailed end up returning, meaning these people will never see proper treatment or the care and tenderness necessary to combat addiction. The failed War on Drugs shows how ineffective it is to lock people away for addiction, something that should be treated as a public health issue. Shifting government spending away from our bloated military and toward public education, a jobs program, and affordable housing would be a massive step in addressing the conditions that lead to addiction in the first place. Despair as a result of the pressure capitalism puts the working class under leads people to addiction without the support necessary to combat it. Better and more abundant jobs along with stable housing could cut at the core of this crisis. Safe injection sites would also go a long way toward fostering a better environment and preventing alienation of addicts as well as the number of deaths due to overdose. It has become abundantly clear that universal health care must also include a sweeping program of mental health support. A country that makes a point to put military recruiters in schools has no excuse to not have therapists and social workers in them as well. Poverty, lack of health care, lack of affordable housing – these conditions create the epidemic. To make any progress we need more than expensive band-aids. Previous articleSeattle School Bus Drivers Strike and Win!